At each relaunch of a scenario, the spawn point will be different. 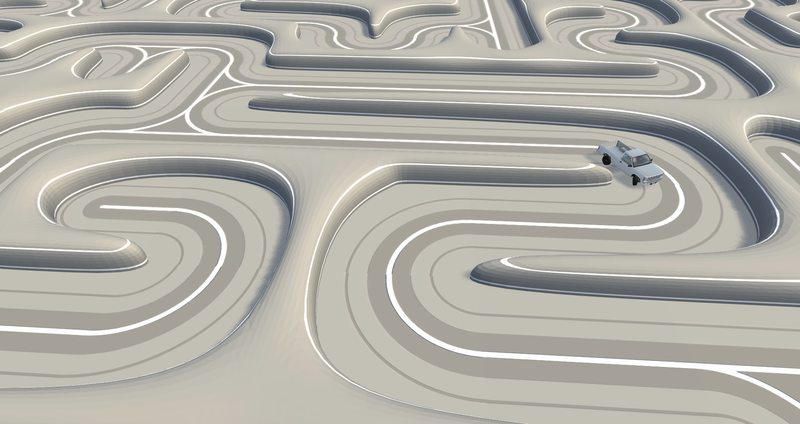 So now you can drive through these maze again and again and have a different experience ! Also if finding the exit is too easy, there's one easter-egg per maze. Let the hunt begin ! Here's a map for the big maze, but each scenario launch will have a different spawn point, good luck to find where it is ! thenerferboy, NoxiousFumes and DoullPepper like this. Error 404: Exit to maze not found. my time is 3:45.05 and found the Easter egg that i will not name to keep the surprise. it would be beter if you set the car to random but other than that Excellent. Dickbutt + finished in 1h07 minutes, god... Great map ! this mod is fantastic but I could easily zoom the camera out and find the end so a roof would be cool. an extra scenario in the dark so you have to use the trucks headlights would be interesting. Putting a roof would be useless, people could zoom the camera through the roof anyway. And furthermore, it allows everyone to have a challenge how they wish,some people might prefer doing an aerial survey before and remember their way to the exit or other persons prefer to drive at random.